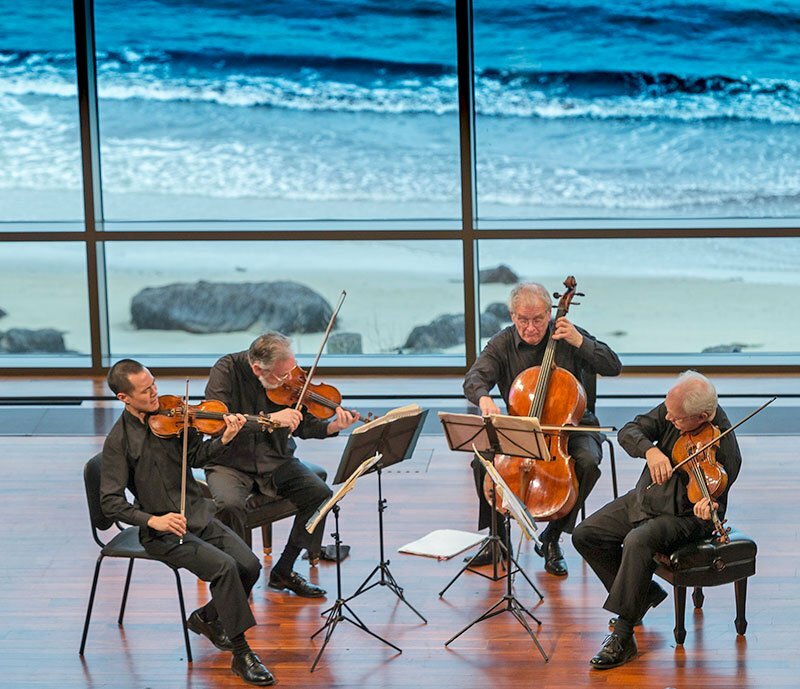 Cape Ann chamber music lovers at Rockport Music’s Shalin Liu Performance Center witnessed a marvelous concert on Sunday by the Juilliard String Quartet. Founded in 1946 by the Juilliard School’s then President, William Schuman, the original grouping accepted the charge to play new works as if “they were established masterpieces and established masterpieces as if they were new.” The quartet currently comprises violinists Joseph Lin and Ronald Copes, violist Roger Tapping, and cellist Joel Krosnick. Astrid Schween will succeed Krosnick at the end of this season, his 42nd. Though the quartet has of course undergone a number of personnel changes since 1946, Sunday’s performance was compelling evidence of its continuing adherence to mission: the artists juxtaposed two staples of the repertoire with a work premiered four months ago, playing all with sensitivity and virtuosity. Mozart’s String Quartet No. 19, in C Major, K. 465, “Dissonance”, the last of a set of six dedicated to F. J. Haydn, earned its moniker from early audiences in 1785 because of its fascinating, almost contemporary Adagio introduction: its throbbing repeated notes with many unstable and dissonant tonalities seem to point the way to a somber first movement. The Juilliard underscored this with quiet foreboding, adding vibrato only gradually. The main Allegro made its intended delightful surprise, the introduction’s clouds evaporating into sunny, buoyant music. The players’ unanimity of ensemble, accents, and dynamics gave the effect of a single player. The Andante cantabile did indeed sing, in soulful, even Romantic, mode. The Menuetto alternated childlike charm with brusque declamations in the manner of an adult’s exaggerated game for the amusement of a child; the stormy, minor-key trio made a stirring contrast. The final Allegro possessed both irrepressible high spirits—notably, Lin’s many exuberant passages as well as all four musicians’ digging into offbeats—and quieter moments of contemplation at points where Mozart elected to go in unexpected harmonic directions. The String Quartet No. 9 by Richard Wernick (b. 1934) is the fourth he has written for the foursome. According to the composer, each of the work’s two movements represents “a response to our oversimplified populist culture with its allure of easy and immediate reward.” Joseph Lin spoke at length to the audience, perhaps unnecessarily duplicating the printed notes somewhat, but also interestingly in comparing the first movement’s affect (marked “Assertive, Aggressive”) to Rockport’s forbidding coastline in the eyes of the first settlers. This was an apt analogy since the work’s musical language is, in today’s vernacular, “gnarly”. The highly accomplished execution displayed immaculate accuracy in complex rhythms with abrupt dynamic shifts. Moreover, the players seized on Wernick’s use of a wide range of string colors and effects. The second movement, titled “per una selva oscura…”, made this listener think “through the valley of the shadow of death” (Lin did, though, translate it “through a shadowed forest”, not merely “dark”). This lament, characterized by a “never-ending throb of repeated notes” somewhat recalled the Mozart introduction heard earlier. Despite several modest climaxes, this atmospheric movement had the effect of steadily diminishing life-force, though with a “final burst of hope from the solo cello.” Again, the composer made intriguing use of many of the different ways stringed instruments can produce sound. Wernick’s latest quartet did avoid “the allure of easy reward”, but in the Juilliard’s capable hands, it consistently sustained interest. The concert concluded with Claude Debussy’s 1893 Quartet in G Minor, Op 10, his only work in the form. The 30-year-old composer took a traditional (some might even say academic) genre and infused it with previously unheard sonorities. The first movement, Animé et très décidé, initially resembled in mood the “assertive, aggressive” beginning of Wernick’s quartet, but rather more mercurial in mood and fluid in tempo. The Juilliard gave us kaleidoscopic scenery on this journey.The scherzo–“Rather fast and highly rhythmic”–indeed had enthralling, vigorous rhythm but was equally fascinating for the contrast of all four playing pizzicato versus three players plucking and the fourth bowing. For me, the third movement, “Andantino, sweetly expressive”, is as seductively beautiful as anything Debussy ever wrote when played as these artists did. Tapping’s opening viola solo kept us guessing where the music’s home key is, as the composer intended. The velvety entry of the other three, with mutes and in a quite unsuspected key, felt like tender caresses. After some more harmonic red herrings from Debussy, the mutes came off and the musicians built gradually to a splendid climax. The modified recapitulation, muted once again, was sublimely beautiful, concluding with the upper three strings evanescing into the ether over Krosnick’s sighing cello. The final movement, marked “Very moderate—accelerating little by little—very lively [or hectic]”, is structurally less coherent than the others though just as filled with attractive musical ideas. As always, the Juilliard’s exemplary unity was delectable, as the group knit the disparate components of the movement together as well as any foursome could. The coda turned up the heat, leading to a brilliant ending. As Joel Krosnick celebrates his final season, I am grateful for his many years of distinguished performances and wish him well when he enters the next chapter of his musical life. Likewise, I am thankful to Rockport Music for bringing the Juilliard here to play such a memorable concert, and I hope the reconstituted four will return soon. Geoffrey Wieting holds Bachelor’s degrees in organ and Latin from Oberlin College and a Master’s degree in collaborative piano from New England Conservatory. He is a freelance organist, collaborative pianist and vocal coach. He sings with the Back Bay Chorale and serves on the Board of Directors of the Old West Organ Society.